So, how does a blind dog know which are his Christmas presents? 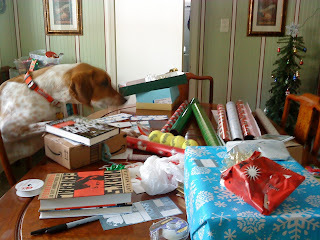 I finished wrapping all the presents (except for the slobbery bone - it needed to air dry) then headed out to the mail stash to open one of the boxes that had arrived from my sister Kathy. I wanted to put the presents under the Christmas tree. The box contained presents for everyone, me, Hugo, Moonie and Ray (Gregg's gift was in a separate package). I deposited the presents under the tree and went to dispose of the box. I came back into the hallway where we had set up the tree to admire it now that it had presents under it (we set the tree up in the hallway so that we didn't have to rearrange furniture - we didn't want Ray to have to learn a new layout - although, honestly, I don't think it would be a problem for him. He's so ADAPTABLE). Ray was nosing around the base of the tree. He stretched his neck out under the tree and very carefully picked up a gift. He maneuvered it out without disturbing any ornaments then stood with the wrapped present in his mouth, his tail wagging. I went to check the tag. It was for him. 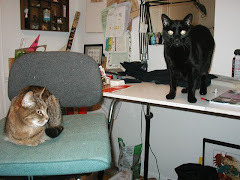 Jean and Greg - I laugh everytime I read something about Ray. 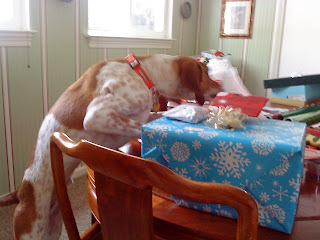 Ray is definitely a great hound, nosing for his presents was so funny that while I'm at work reading his blog and laughing, my co-workers must think I'm crazy. It's been awhile since I was reading your stories about Ray and I believe that in another life - Ray was the Director of "Life with a Hound". He is bringing so much pleasure to others. Thanks for bringing the rest of us enjoyment. Ray, the Blind Dog should be on the "world's funniest videos". Thanks for reading! And thanks for leaving a comment. It's nice to know that Ray has fans. I'm going to take a chance and see if you see comments on one of your posts from 2009. I have been reading all your posts, starting at the beginning. I agree with Anonymous above; reading about Ray, you and your family have made be laugh, cry, go "hum? ", and generally have a good time. I can't wait to read the next one! It's always nice to have a new fan, Melinda from Texas. And yes, I read all the comments. I live for the comments!